Acoustic guitars are very sensitive to low humidity and need to be kept properly humidified in dry climates and during cold winters. While it's ideal to get a proper humidifier such as Oasis Humidifier[? ]Affiliate Link, you can also create one from a sponge and a plastic bag. Take half of a cellulose sponge and soak it in water. Squeeze out the water so it is no longer dripping, but just moist. Put it in a sandwich bag. Now tuck the sponge behind the strings by the bridge, with the bag opening facing up. Store the guitar in its case, standing upright, as tilting it upside down may cause some water to leak out. After putting on a capo, clip on a tuner and make fine adjustments to the tuning. Note that the capo will change the actual notes quite a bit, but you will only be adjusting the tuning a little bit, looking for a perfect match of whatever note shows on the dial. Capos do affect the intonation of your guitar, and putting one on can mess up the intonation just a hair. The amount it affects your tuning depends on the capo, the guitar, and its strings. At the low end of the price spectrum, guitar picks are made of unremarkable synthetic polymers, usually plastics. At the high end, picks may be made of organic materials such as bone or horn, wood, or high-performance synthetic materials. You can fashion your own pick out of any workable raw material such as bone, horn, or wood. If you don’t have these lying around, you can cut/carve a pick out of any thin sheet of plastic material. You can even use a premade die to do this, although it would take you quite a long time to save any money. Used guitar strings don’t have to be thrown out right away. If they’re not broken, and the ends are still long enough to wind them back on, they can be boiled and re-used. This was common practice "back in the day", and it still persists in some parts of the world. Boiling the strings will remove dirt and oil that have built up on them, and extend their playing life. It will not correct wear and kinks that have accumulated in the strings. If you need to clip the end of a guitar string in a pinch, try using a toenail clipper. Don’t even bother with a regular fingernail clipper. Keep in mind this is likely to slightly damage the teeth of your clipper. But it works in an emergency. You can also use most pairs of pliers for this, as most of them have a clipper/wire stripper built-in to the handle. After putting a new set of strings on, you’ll need to cut the end off to shorten it. You can use a pair of pliers to bend the tips to a harmless U shape so that the string doesn’t poke you. Better yet, just clip it super short. If the strings are installed properly, you can clip the ends very, very short with no risk of it coming out. 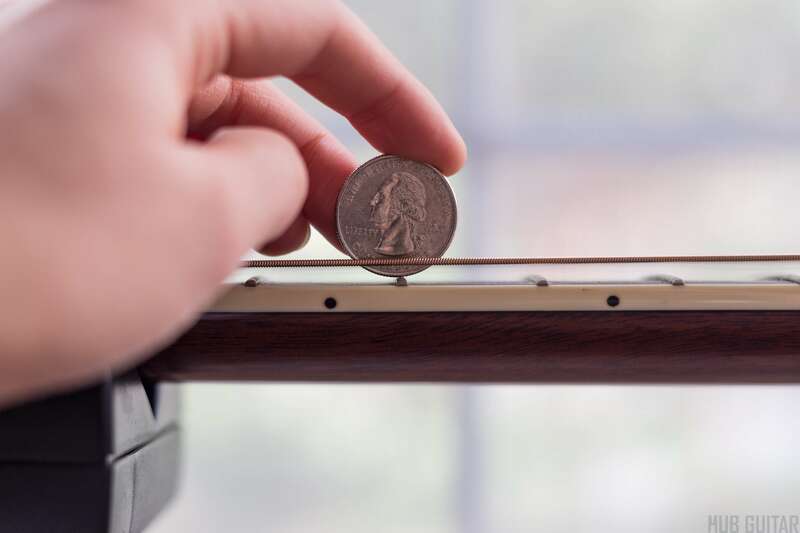 If you have buzzing on an open string, but not on any other fretted note for that string, you’ll need to check your neck’s relief. If it turns out adjusting the neck is not a possible fix for this problem, the only way to correct it is to raise the string as it sits in the nut slot. If the nut slot is cut too low, you can add dust and superglue to raise it back up a hair. Then, using a file you can cut it back down to the ideal depth. Tired of forgetting how you got that awesome tone? Don’t forget to snap a picture to record the settings you used to get it. Buzz can come in from fluorescent lighting or in the A/C power. Shield your electric guitar by removing the plastic plate and putting copper tape all around. Use a power cleaner (or even battery-sourced amplifier) to avoid A/C buzz. Use the process of elimination to find the source. Is it A/C? A battery-powered amp will tell you the answer. Is it the lights? Turn them off. The cable? Swap it. The guitar? Try another guitar if you have one. Fingerpickers sometimes have to deal with the unpleasant reality of a blister or wound on the finger that prevents playing. If you’re in a true bind, try getting some medical glue from the pharmacy. This can bind the wound together, long enough to play another song or two. Trying to play in the cold? Soak your hands in very hot water for about 5 minutes. This should bring them up to normal body temperature, and hopefully it will keep them there for awhile. You can use a captains of crush grip or other similar tool to improve your hand conditioning. Old George does not like to be neck-deep in guitar string! Put a US quarter on the 12th fret. The strings shouldn’t be higher than George Washington’s neck. This can give you a rough idea if the guitar needs to be set up. If the strings are too high at the XIIth fret, you’ll need to have the saddle removed and sanded down to lower the action. 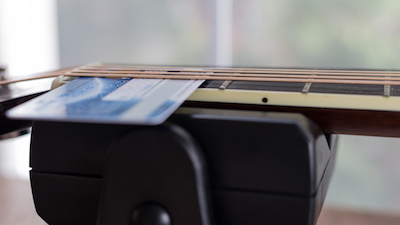 A credit card should not fit underneath your strings! Put an index card under the strings. The distance between the first fret and the strings should be just a hair bigger, meaning you can slide the index card underneath without much of a gap. A thin piece of paper will slide easily. But a driver’s license should be too thick!